A 35-year-old motorcyclist was taken to hospital after he was involved in an accident with a car at Pioneer Road North on Thursday night (Nov 22). 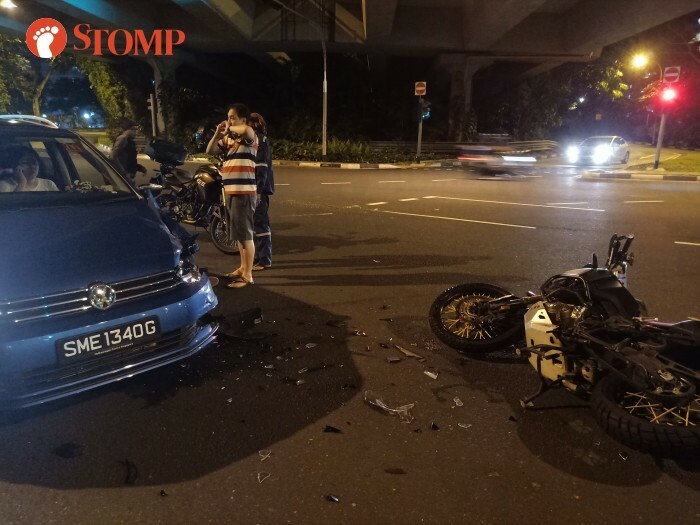 Stomper Putra alerted Stomp to the accident and shared photos from the scene. In the photos, a motorcycle is seen lying on the road and pieces of debris are scattered around the area. A blue Volkswagen at the scene also appears to have suffered damage to its left-front side. In response to a Stomp media query, a police spokesman said they were alerted to the accident at about 8.53pm. The motorcyclist, a 35-year-old man, was conscious when he was taken to Ng Teng Fong Hospital.